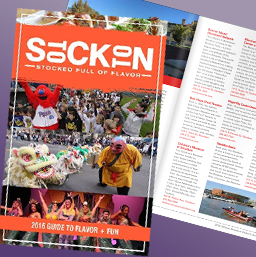 Beautifully situated on a historic waterfront, Downtown Stockton is the destination of choice to celebrate art, food, music, sports, theater, and recreation. Explore diverse, local, and ethnic eateries, many located inside signature historic buildings. Enjoy hockey, baseball or live entertainment at the Bob Hope Theater, Banner Island Ballpark, Regal Cinema and IMAX Theater, or at Stockton Arena. Walk along the waterfront Joan Darrah Promenade and enjoy the state of the art marina and kinetic public art. Or spend a warm day with the family at Weber Point playing at the playground shaped like a pirate ship or cooling in the interactive fountains. DSA has hosted casual Downtown bike rides in partnership with local biking groups since 2015. For 2019, DSA has added an April ride to the Full Moon Riders season, so there will be 7 rides total from April – October. Each ride takes place on the night of the full moon, this years dates are April 20th, May 18th, June 17th, July 16th, August 15th, September 13th, and October 13th. Public art is present in downtown wherever you go: on sidewalks, inside buildings, in the civic squares and plazas. 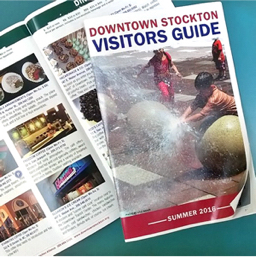 From brass inlays in the sidewalks, to ornate tree grates and murals on buildings, Downtown Stockton features a wide variety of styles and artistic visions. Art events and programs abound creating a dynamic and creative environment where there is always something interesting to do or look at. Downtown Stockton has over 50 ethnically diverse eateries, from intimate hole-in-the-walls to large white-cloth restaurants. Whether you’re looking for a healthy breakfast snack or a multi-course dinner, you can satisfy your cravings and choose among versatile menus from sushi to pasta and from hamburger to fresh salad. Although shopping has not yet caught up with the downtown’s exciting dining and events, you can always find here unique or last minute gifts. Several mom-and-pop and curio shops sell anything from jewelry and watches to cosmetics and home decor. Downtown Stockton has a wide range of venues, whether you are looking for a place to hold a small meeting or a large party. Conveniently located in proximity to freeways, the county airport and many civic amenities, it is a perfect place for a business or family gathering.